Growing up near Detroit, when people talked about highways or interstates, they reference their names. No, not just their numerical assignment in the Interstate Highway System or respective state highway system. That'd just be boring. Listen to any traffic report in somewhere like Chicago or Detroit, and even New York. You'll hear some familiar historic names. The names of former mayors, presidents, military figures or major contributors to the economy are used as tributes in highways naming. In August the Chicago Tribute graphics team published an infographic explaining the "notable names behind Chicagoland's expressways." There they have the Kennedy (I-90 / I-94) the Dan Ryan (I-94 / I-90), the Eisenhower, or Ike (I-83) and the Stevenson (I-55), among others. 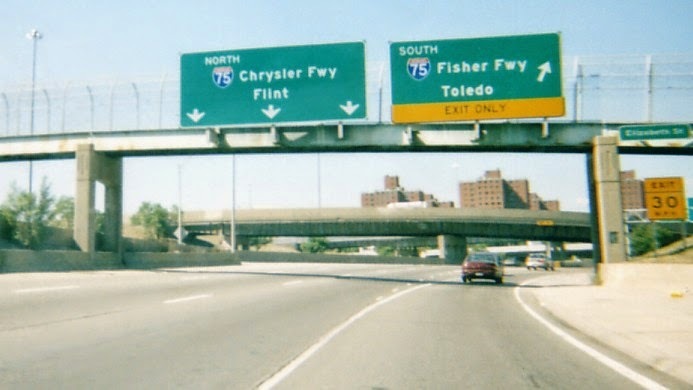 In the Motor City there's the Chrysler, (I-75 north of Downtown Detroit), Fisher (I-75 south of Downtown Detroit), the Ford Freeway (I-94), The Jeffries (I-96) and the Reuther (I-696). (More on Detroit highway and street names here.) Many of Detroit's highway names take on the names of contributors to the city's automotive history. Even Dallas has the Lyndon B Johnson Freeway (I-635), George Bush Turnpike and Tom Landry Freeway (I-30). Here in Houston we have geographic and directional names for interstates and highways rather than paying homage to politicians and influential people, with exception of the Sam Houston Tollway/Parkway, or Beltway 8. If we did start naming other highways for individuals in Houston, what names would we end up using? Some names might be out of the running, especially if they're used for prominent streets already, for example, the Allen Parkway. What about I-45 south of Downtown Houston? It's known as The Gulf Freeway, but what about The Holcombe Freeway? After all, it was mayor Oscar Holcombe, who in 1940, "announced the abandonment of the four remaining street car lines in Houston and the transfer of the title of the right-of-way of the Galveston Houston Electric Railway to the city of Houston" (94). Maybe I-45 south to Galveston might sound better as "The Van London", named after the head of the TxDOT Houston office at the time, W. J. Van London. It is said that Van London influenced the preliminary design of what became I-45. Could we call I-45 north of Downtown Houston "The Mitchell", in reference to George Mitchell, the developer of The Woodlands? Sure, why not. It'd be tempting to name a highway after U.S. representatives Barbara Jordan or Mickey Leland, but they both fought the expansion of I-45 through Houston's minority neighborhoods, including the Third Ward. Instead, Houston has a Texas Southern University school of public affairs named for the two, as well as a federal building and airport terminal named after Leland. We can still call I-10 to the west of Downtown Houston the Katy Freeway, but what about I-10 east of Downtown Houston? Surely we can come up with something better than East Freeway. There's plenty of streets named for former mayors of Houston. The last names of McGowan, Ennis, Baldwin and Holman all adorn street signs in Houston. Maybe it's time to name a highway after a mayor. What about one for Roy Hofheinz? After all, he was part of the reason that Houston got the Colt .45s, the Astrodome, and later, AstroTurf. Maybe we can even line some of the median with AstroTurf as a further honor. And, for the Grand Parkway (Texas 99), its current name is fine, but what about calling it "The Holmes?" For the sprawl-inducing Grand Parkway, like many other road projects throughout history, a portion of the Grand Parkway fell into financial question but was saved by Ned Holmes, a developer and former TxDOT commissioner, after he "found" and additional $350 million in TxDOT's budget. It'd be a credit to Holmes and his saving of the project. 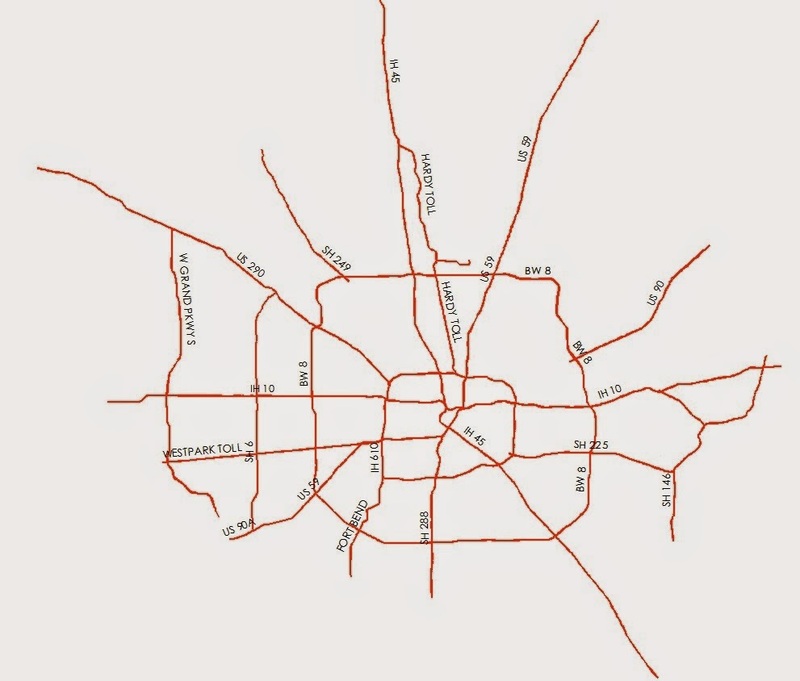 The I-610 Loop (some more history here) is probably too entrenched in the vocabulary of Houstonians, and it probably plays too large a role in general distinction and classification for citizens in Houston. (You know, are you "In the Loop", or But, there's got to be a way to break down the confusion of all the directional prefixes that are used to give directions. Maybe we can call the east loop the "Jones Loop" after Jesse Jones, who was named Houstonian of the Century in 1999 by the Houston Chronicle, and served as the United States Secretary of Commerce from 1940-1945 under President Franklin Roosevelt. After all, 610 passes over the Houston Ship Channel, for which Jones helped secure the federal funding needed to build it. And, maybe we can name the west loop the "Hines Loop", after real estate mogul Gerald Hines. Hines was responsible for the development of the Galleria, as well as many others nearby. Instead of the Southwest Freeway (US-59 / I-69 south of Downtown Houston) how about "The Sharp Freeway"? Frank Sharp developed the Sharpstown subdivision in southwest Houston and provided the 300-foot right-of-way needed to construct at least ten and a half miles of US-59. Of course, in a bind, we could just name any highways (U.S. 290 has a relatively boring history), especially The South Freeway, TX-288, after Albert C. Kyser, head of the TxDOT Houston Urban Project Office from 1955 to 1972. We could also name the I-45 and I-10 interchange after Kyser or former City of Houston Planning Director Ralph Ellifrit. They were the most influential men in the design of the downtown interchange complex (132). For a city that loves its roads and highways, it's hard to believe that there aren't many named in honor of influential Houstonians. One member of Houston's city council even wants to name a street after Destiny's Child. What are your ideas for some other names for Houston's highways? Let's hear them. Good, bad, outlandish; they'd all be entertaining. ***For more information on Houston's highways, be sure to read Houston Freeways by Oscar 'Erik' Slotboom. It's a tremendous body of work, and is a tool that allows us to see how Houston has changed over time, and the impact that highways have had on our city. 1949 - A young Gulf Freeway at left, looking to the west-northwest. Downtown Houston at the upper right.